On Tuesday, September 18th, Sacramento saw its first ever Burger Battle. It was a vicioius cook off of epic culinary arts between de Vere’s Irish Pub, Restaurant Thir13en, The Eatery, Kupros Bistro, Delta King, The Chef’s Table, Michelangelo’s Restaurant, Grange Restaurant and Bar, The Porch, The Golden Bear, The Squeeze Inn, Ettore’s Bakery and Restaurant, Flaming Grill Cafe, Shady Lady Saloon, and Krush Burger. With all those names, plus more, there was much to consume on this evening. For my part, I consumed all I could. The atmosphere was great. A burger battle at a baseball field is an American-ly awesome as it gets. To top it off, Hero’s Last Mission, a Sacramento local hot band, provided various sets throughout the evening. And just when you thought it couldn’t get better, there were various drinks all around to be had. And lastly, and most importantly, proceeds of the event go to support a great cause – the Crohn’s and Colitis Foundation of America (CCFA). With this event, awareness was definitely brought to the diseases, as well as to CCFA and their mission. Through sufficient funding, we can only hope a cure will be found. All the burger’s were delicious, but only one will reign king of Sacramento. In my humble, not-so-expert opinion, the Shady Lady Saloon had the best burger. Obviously all these burgers are great, and no one can go wrong going to any (or many or all) of these fine venues, however, I fell in love with the Shady Lady Saloon’s burger. Though one burger will rule them all, they are all delicious. Overall, the Sac Burger Battle was a great community event that definitely benefits everyone in one way or another. I am always a fan of functions like this that bring people together. I pray and hope a cure will be found. In a perfect world there would be no diseases, or at least nothing beyond a cold or a fever. However, that doesn’t exist. Though I hope the cure is found soon, I pray the burger battle will never go away…ever. Nothing says awesome like eating and drinking from over a dozen places all in one location. A great start to hopefully a great running tradition here in the Sacramento region. 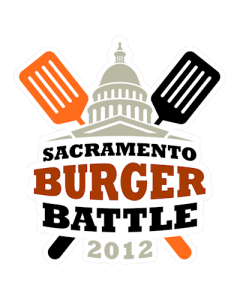 For those who missed it, start planning to attend the 2nd Annual Sac Burger Battle next year. P.s. A Sac Pizza Battle in the Spring would be awesome, or anything else. Just more events like this is awesome. By: Josue “Josh” Alvarez Mapp, a.k.a. DJ Mappquest. Manager of KSSU. A friend to some, a legend to all. Tune in to “Sports Madness” every Tuesday at 6 PM for sports talk, and “5th Ave and Wall St” on Fridays 5-7 PM for random music and talk.